Sue Havens was born in 1972 in Rochester, New York. 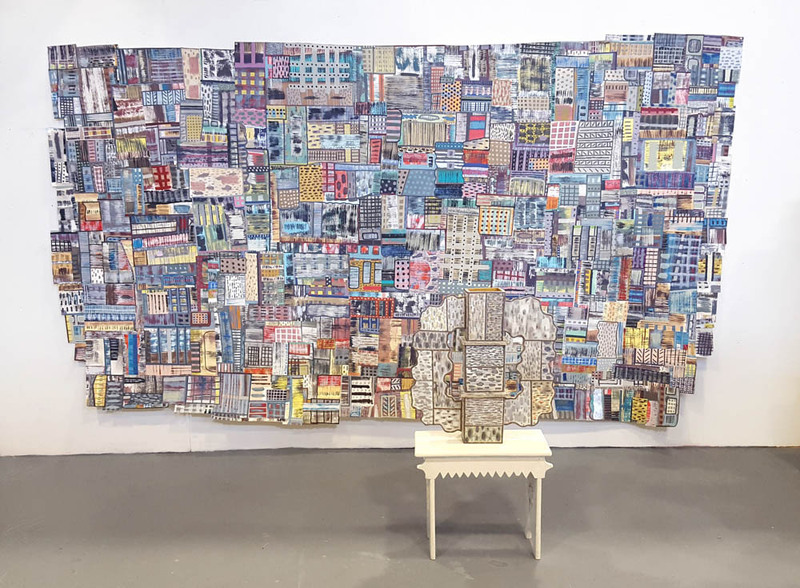 She has exhibited with Regina Rex, Jeff Bailey, PS 122, Postmasters, Frederich Petzel, Art in General, Momenta Art, Sara Meltzer, OK Harris, Pierogi, The Houghton Gallery at The Cooper Union, among others. 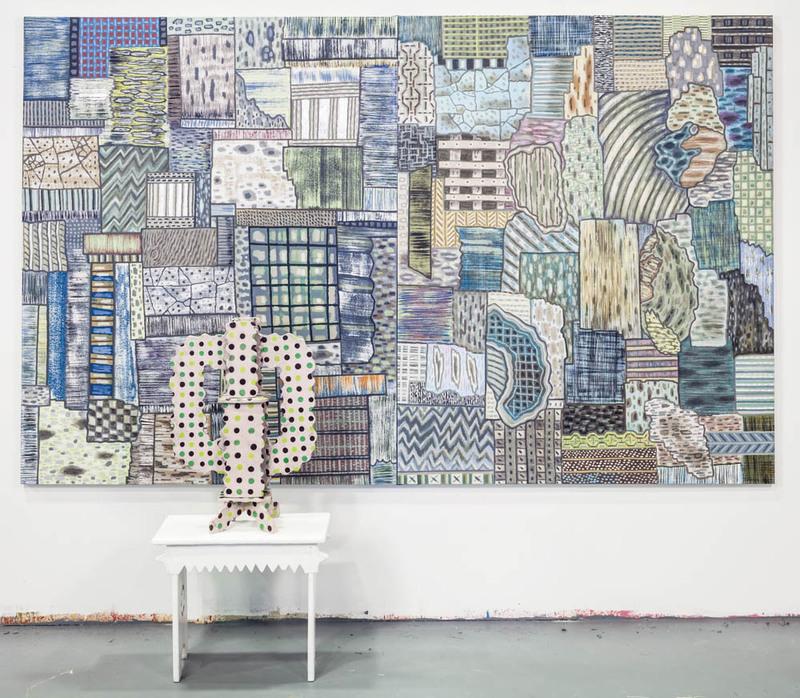 Havens is a 2008 fellow in Painting from the New York Foundation for the Arts. She holds a BFA from The Cooper Union, and an MFA from The Milton Avery Graduate School of The Arts at Bard College. She is the author of "Make Your Own Toys," 2010, with Random House (Potter Craft). She currently lives in Tampa and is an Assistant Professor of Art at The University of South Florida. My current work is reflective of my journey from New York to Florida, as well as a recent trip to Turkey, my husband’s homeland. Situated within contemporary notions of the interdisciplinary arts, I am expanding a body of work that demonstrates a complicated dialog between media, acknowledging the contemporary discourse surrounding the interplay between painting and ceramics. This new work reflects the new palette and architecture of my changed surroundings, as well as patterns and ancient forms I found in Turkey, while also recalling forms I have been describing for years. My paintings are paradoxical: flat, yet dimensional, and bold with an inner quiet, cartoonish but serious. I am interested in the transformation that happens when these opposing elements are confronted with a new context. In my work there is often a geometry with a built in wobble--a structure with an underlying undoing-a precision with a persistent irregularity. There is tension in places where planes transition- they collide and overlap, and where muted colors meet bright colors, forming a harmonic and balanced, yet discordant tension. I am motivated by that which occurs when these disparate things engage. 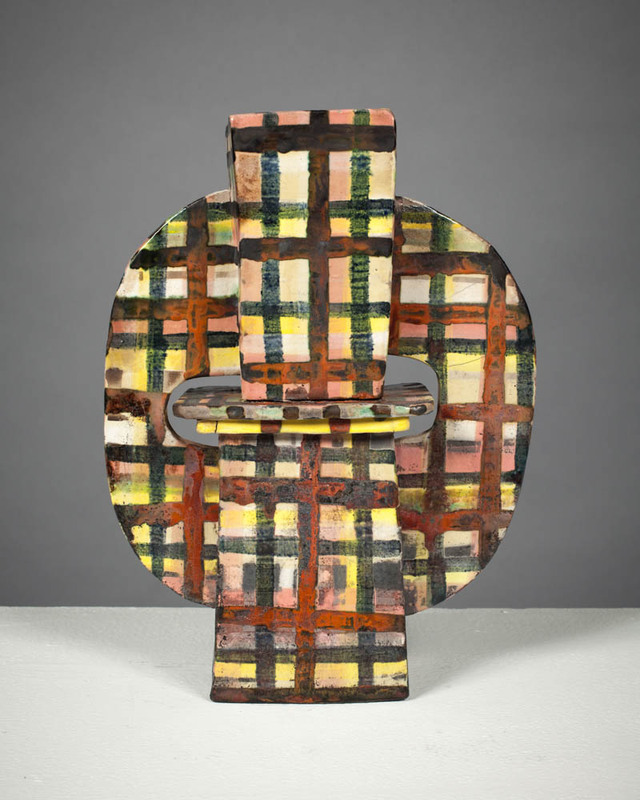 This expansion has recently expanded into ceramic and paintings in tandem. Sue in the studio. Photo by MacArthur Freeman. Hi Sue! Can you tell us a bit about your background and what motivated you to become an artist? I grew up on 114 acres in upstate New York, and was drawing and making things for as long as I can remember. I remember having a microscope and collecting buckets of pond water to look at, then draw. I also remember making mazes, maps, “fun pads” with my sister. Would you say that you work in series or are you working across many styles and media concurrently? I’d say I work in multiple series, which span media. Collage paintings, paper constructions, drawings on paper, ceramic objects, all forms which have expansive possibility. When did you begin to use clay to make sculptures? I began in 2015 with my new position of assistant professor at the University of South Florida. I learned I had 24-hour access to the ceramics studio, and I went for it. In some of your images, the sculptures are shown in front of the paintings. What is the relationship between the three-dimensional and two-dimensional objects? The relationship is very interconnected. The 3D object came from the years of drawing and painting forms which suggested something that might actually be dimensional. They were the precursors to the ceramic forms. Paradoxically, The 3D objects are painted in such ways which flatten them back to 2-D in a cartoonish way. I am reminded of a time when I took a photo of a friend in front of a mural, and the photo of the friend in front of that mural would resonate for years. A 3D person in front of a 3D painting was interesting, as it made the painting more painting-like, and conversely, the person more dimensional. So it is the context that interests me. Can you walk us through the stages of planning and making a painting or a sculpture? The first ceramic forms were made completely without planning, I was running to the studio each day for months and months—I love to make and build as I go. Disasters do happen, but also real things happen. I was building forms that were in my hand-memory from my previous paper constructions, and then just winging it. So, after this very prolific and breathless phase of making, I look at what I’ve made, take pictures, scale up in the copier, think, think, look, and lately I am analyzing what was learned and strategizing about scaling up forms that I discovered. I discovered technical issues about building larger slab forms, and also spent months testing glazes. With painting it’s similar. I start with some idea that is pretty vague. Many times I start and then start again after some initial failures and discomfort. I need to relax into the mode of making, then I build a painting as I go. It becomes something that I don’t expect. For example, recently I had made some paintings on large paper, with components that were modular. I also made paintings on canvas. But in an instant, I moved onto these 40 foot rolls which had a completely different feeling. Knowing that I could be less precious, perhaps, with the paper helped. Or moreover, cutting and painting wildly and freely on paper, making sloppier lines and faster decisions, cutting and rejoining again and again—that was the recent breakthrough that allowed for the collages to happen. Also—The paintings became more of things than works adhering to the principles of “the canvas”. That said, I always seems to cycle back to painting on canvas. With any of these I work and work until it feel like it’s adding up to something. Is drawing an important part of your practice? Do drawings inform the other work? I spent most of my earlier life drawing. I think it inherently informs everything I do. I used to draw constantly. Now I can see it before I need too draw it. But I still do draw at times, and it’s a welcome place that I miss. My life is busier than it has ever been, so I have less time to ramble there. Pattern is an important element for you—do you use any references for the patterns, and if so, do their origins have any significance? Yes. I have patterns from fabric collections. If you see my book Make Your Own Toys—you will see in those toys the exact sweaters and color that I imitated with paint, directly. I like the meaning in an old thrift store find…or in a funny can of sardines. The personality of commercial products, but maybe from the 70’s. I also have a lot of references from a recent trip to visit my husband’s family in Turkey. They gave me a beautiful hand woven rag-type of rug. But I have 1000’s of image references of patterns and forms that I draw from. I match color specifically to those. I don’t ever want to be direct about content, because I know it’s in there, in a more subtle way that might be discovered or felt. Seeing your work in photos makes it difficult to fully appreciate the textures of the sculptural work, but they seem really essential for you. Is this true? Can you describe how you think about the texture of these pieces? Actually, the textures in those do not exist! Only in that the texture is imitated with paint. I am painting on flat slabs, as one would in painting. It is just this year that I am beginning to experiment with actual textures pressed into the clay. I have found that the actual texture is a whole different thing, and slightly overbearing! I have been pressing clay into the parents bench at the park. A great large dot pattern, and I love being able to have that additional content into my work. I am a new parent, and my work is not overt in it’s meaning, per se. Have you always used acrylic for the larger paintings? What about this medium is ideal for creating your most recent body work? How do you go about choosing colors? Over time I have developed a sense about color through the collections of objects that I have. I’d paint from those things. Over time it became intuitive. My paintings used to have stranger and more blasting color combinations, and over time they quieted down. I wrestle with color, tending to knock it down. Symmetry / asymmetry, funny/serious, paradoxes of flatness and dimensionality in forms, minimalism/cartoony, abstraction/suggestion of figure, monumentality and opposite, precision/non precision, loudness/quiet… I like this question! The death of my older brother, who was exceptionally special and funny. That his life was so full at the young age of 19 astonishes me. I don’t know if there is a day that goes by where I don’t think about the potential we have in life, but also the potential we have to lead a living death, or to not thrive in life. So this whole art path, it’s a choice of perseverance, of keeping going, and I am amazed by what this involvement and obsession has given me so far. NEW YORK! Was there for 25 years. I’m so glad I was there before it became really gross. Over time, there was a pretty long trajectory of weathering bad jobs and better jobs, as a bakery truck driver, artist assistant, a stint at the Wax Museum painting the figures, working at The Danbury Mint, touring with a band called Ida playing accordion and clarinet while making posters and paintings, making a plush toy book, and making drawing and paintings when work was scarce all. Then, finally, teaching. This became a career before I really expected or intended it to be. Teaching was an unexpected job. I was fearful of doing it, but from the first day I stepped into the classroom I found this new louder person came out, and I found I loved talking with students about the very nature of the things I’d been quietly investigating for let’s say 40 years. Wake up, get my son Wesley to his little school, rush off to work on whatever branch of things I can work on. My new position at USF has many pots on the stove. I was fortunate to be awarded a grant this year which gave me a sabbatical from teaching. So now all my focus is making paintings, ceramic objects, or working on exhibitions, reading art history, then there’s family and watering my tomato plants. So many! Off the top of my head Lucy Mink, Shari Mendelson, Betty Woodman of course, Arlene Schechet, I’ve got a nice fat Picasso book next to my bed, so, so many more. Bill Traylor. I love quiet in the studio, it can be hard to get the music right. I usually just have to quiet down and settle in and things happen. If I’m hungry I can’t work, gotta have the food in balance. Well, I’ve been a full-fledged multitasking parent of a 4-year old with this tenure track job, and aside from reading the daily horrors that unfold, I am quieting down and pouring over histories in painting and ceramics. Also My Life With Things by Elizabeth Chin and some others. Often I listen to WNYC and I forget I’m in Tampa until the weather is mentioned, but when that gets too depressing I have a wide range of interests musically that I’ll put on in Pandora. Somehow the other day it was Nirvana/Pixies. But then one day it was really bland house lounge. Hard to get it right. Often I’ll turn on classical piano or turn if off and do blocks of quiet. I’m in an old gymnasium—with a hoop over my ceramics! It’s big with lots of wall space. Since I’ve arrived my studio space expanded and so did my work. I’m not a stickler about the right light. One of my biggest influences actually was this auto mechanic painter in Queens who painted these amazing carburetors and parts on the side of a building. This was an important referent for me. That’s the kind of painting I’ve admired and so it’s not subject to lighting particulars. Could look good even in dim light! How do you navigate distraction or lack-of-motivation while working? I am never not motivated, but distracted, yes! With family and my job there are so many distractions—but with the isolated studio space, I am fine. It is essential. If I go in there, things happen. It’s not important, really. When I was in New York I rarely saw people unless I’d go to openings. This works out well because I go to New York a lot and run into people and am focused on what I see, and when I’m here working in the studio I am often in touch with my friends—ahhh the social network. My dear talented friend Jan Kotik, who sadly passed away in 2007, said in my studio around 2004, “Sue, It’s a marathon”. The long trajectory is real when you are an artist. Lots happening! I have a show at Park Place Gallery called Still Life coming this Friday, and a solo exhibition there in April. I currently have an installation at Mindy Solomon in Miami. Something coming up at Field Projects in the Spring, and I’m excited to be doing a talk at UMass Amherst also in the Spring. There’s also a nice interview with me and Franklin Evans as part of my recent exhibition at Coco Hunday, curated by Jason Lazarus. To find out more about Sue and her work, check out her website.